Search for homes "Netflix-style" on the binge-worthy new Homesnap Apple TV app. This app brings your smartphone and TV together for home-searching bliss. Use HomeSnap to add next-level presentation skills to your everyday tasks and impress clients. Smart, beautiful and innovative: three words I would use to describe the new Apple TV application that Homesnap has added to its portfolio of services for consumers and agents. Integrations like this are where Homesnap stands out in a sea of home search options. Homesnap’s focus on providing distraction-free home surfing and connecting consumers with their designated agents in a seamless fashion are showcased in this luxe new application. Integrations like this are where . @Homesnap stands out in a sea of home search options. 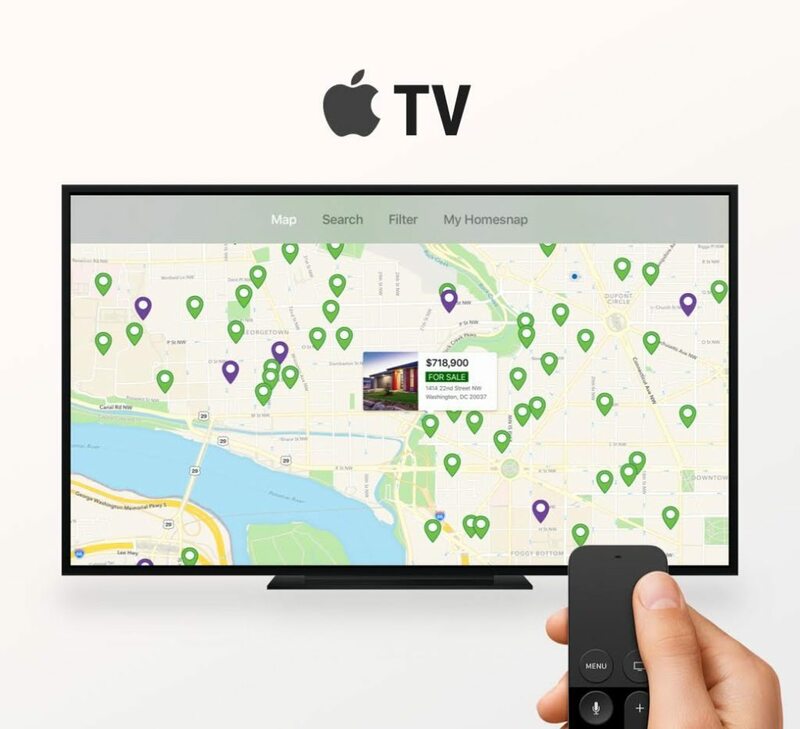 Homesnap’s new Apple TV app allows users to search for listings on their TV and sync searches between their phones and TV. The goal of the app is to provide a more connected, collaborative home search platform that you can use with someone else in the room. The goal of the integration is to provide a more connected, collaborative home search platform. Users can set search filters on the TV and then jump from listing to listing using the Apple TV Siri remote. They can swipe through gorgeous, high-resolution photos on the large screen and even use voice commands to search for areas and listings. They can save homes as favorites and browse recently-viewed homes and contract/sold data where available — all on their TV. It’s all about the maps. Multi-layered search features allow consumers to dive deep into this smart application and discover aspects about neighborhoods that have become serious factors in searching. Homesnap’s product development team members are not only design connoisseurs — they are also wizards! Users will also be able to take advantage of a custom-crafted gesture to “swipe” listings from their phone to the TV. Using a two-fingered upward swipe, users can transfer the listing from their phone to their TV if they are using the same Wi-Fi network. Why? It makes sharing easier for several people to share in the experience, and let’s face it — don’t we all need a little more magic in home searching? Homesnap for Apple TV App Preview from Homesnap on Vimeo. If you are investing in professional photos for your listings, they will sparkle in this application. Show homeowners how your listings pop against your competitors’. Do you meet buyers and conduct an assessment of their needs? This tool would add a powerful “wow” factor to that presentation. This will be a great way to convert people to your branded Homesnap app and engage and capture potential walk-ins. 5. Finally — wait for it — Lobby Mode! Brokers: this is a great way to add a robust and up-to-date presentation of your listings to customers in the office — so much better than the weather channel or CNN. Can you imagine this on proper display in a window facing walking traffic? Perfect! Ready to get started? Grab an Apple TV and tune in. Sign up, and discover more about this new feature and more at Homesnap.com.